There are 19 Assisted Living Facilities in the Kennewick area, with 13 in Kennewick and 6 nearby. The average cost of assisted living in Kennewick is $3,202 per month. This is lower than the national median of $3,345. To help you with your search, browse the 65 reviews below for assisted living facilities in Kennewick. On average, consumers rate assisted living in Kennewick 4.4 out of 5 stars. Better rated regions include Pasco with an average rating of 4.4 out of 5 stars. Caring.com has helped thousands of families find high-quality senior care. To speak with one of our Family Advisors about assisted living options and costs in Kennewick, call (855) 863-8283. Kennewick is part of the Tri-Cities area of Washington, joining forces with neighboring cities Pasco and Richland on the Columbia, Snake and Yakima rivers. Many senior citizens here enjoy wine, golf courses and the small-town atmosphere, and if they need help with some or all of the activities of daily living, they can choose from 13 assisted living facilities in Kennewick, or the 10 more in Pasco and Richland. The Washington State Department of Social and Health Services, Aging and Long-Term Support Administration, handles the licensing for these facilities in the Tri-Cities region and elsewhere in the state. Each facility has a minimum of seven residents receiving room, board and assistance with daily living tasks. Not much precipitation falls here. In fact, Kennewick receives only eight inches of rain per year and just three inches of snow. This is advantageous for seniors, helping them stay active year-round. Kennewick has above-average air quality when compared with U.S. figures. The city scores 67 on a scale of 1 to 100, while the nationwide average is 58. Wildfires in the summer do sometimes negatively affect the air quality in Kennewick, so seniors should keep an eye out for any air quality alerts. Seniors should take the usual precautions to guard against crime. The U.S. rate for violent crime on a scale of 1 to 100 is 31.1, and Kennewick’s rate is 24.1. Its property crime rate is above-average at 46.7 — compared with the national average of 38.1. The overall cost of living in Kennewick is somewhat higher than the national average, mostly due to housing costs. Seniors may have to pay more for assisted living here than in other states. However, next to the even higher Washington state averages, Kennewick may seem like a bargain. Ben Franklin Transit handles public transportation in the Tri-Cities area. In general, seniors 65 and older can ride for free. The Kennewick region has a number of museums that can make for interesting day trips. Examples include the Manhattan Project National Historical Park and the Burke Museum of Natural History and Culture. The Toyota Center hosts several Broadway shows each year, and the area offers ballet, art galleries and opera. Assisted Living costs in Kennewick start around $3,202 per month on average, while the nationwide average cost of assisted living is $4,000 per month, according to the latest figures from Genworth’s Cost of Care Survey. It’s important to note that assisted living rates in Kennewick and the surrounding suburbs can vary widely based on factors such as location, the level of care needed, apartment size and the types of amenities offered at each community. 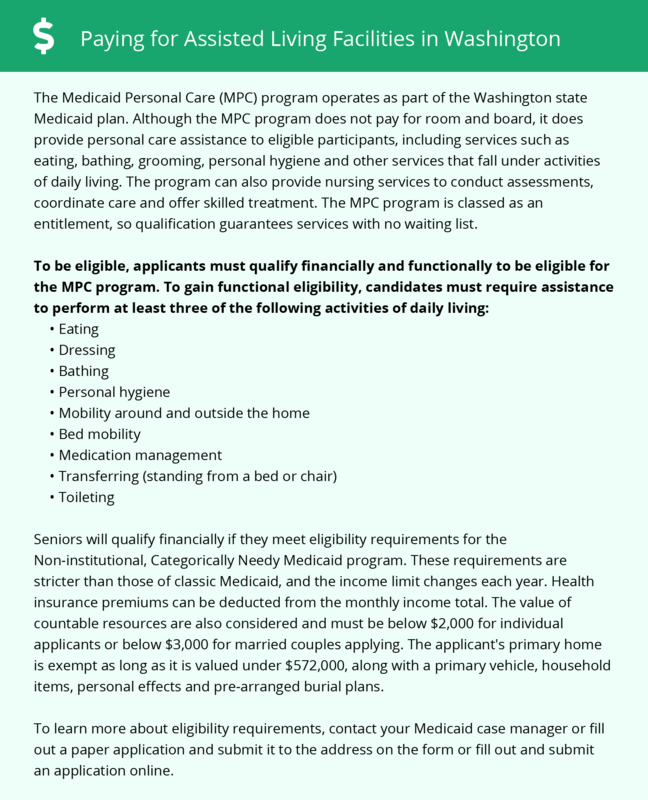 Some seniors in Kennewick may qualify for help with assisted living through four Washington programs: New Freedom, Community First Choice, COPES and Medicaid Personal Care. To see a list of free assisted living resources in Kennewick, please visit our Assisted Living in Washington page. Kennewick-area assisted living communities must adhere to the comprehensive set of state laws and regulations that all assisted living communities in Washington are required to follow. Visit our Assisted Living in Washington page for more information about these laws.